Gold pulled back overnight, trading in a range of $1327.55 - $1334.90 and consolidating its $23 rally from yesterday that brought it to a two week high. A weaker US dollar provided some early support for the yellow metal, as the DX continued to slide in response to the dovish facets of yesterday’s FOMC statement and comments by Powell (DX down to 3/7 low of 89.39). Later during European time, the dollar recovered (DX to 89.77), bolstered by weakness in the euro ($1.2385 - $1.2310, lower than expected German and Eurozone PMI data), and pressured gold down to $1328. A move down in the US 10-year bond yield (2.889% - 2.839%) and mostly weaker global equities (escalating concerns over trade war erupting as US plans to announce new tariffs on China over intellectual property later today) were also supportive for gold. The NIKKEI was up 1%, the SCI fell 0.5%, European shares were off 0.8% - 1.2%, and S&P futures were -0.8%. A pullback in oil from the 6-week high made yesterday (WTI from $65.74 - $64.80) weighed on stocks. At 8:30 AM, a worse than expected reading on US Jobless Claims (229k vs. exp. 225k) pushed the US 10-year yield down to 2.817%, and knocked the DX back to 89.62. Gold climbed in response, but was capped at $1332. At 9AM, a stronger US Housing Price Index (0.8% vs. exp. 0.4%) took the 10-year yield up to 2.834%, and brought the DX up to 89.80. 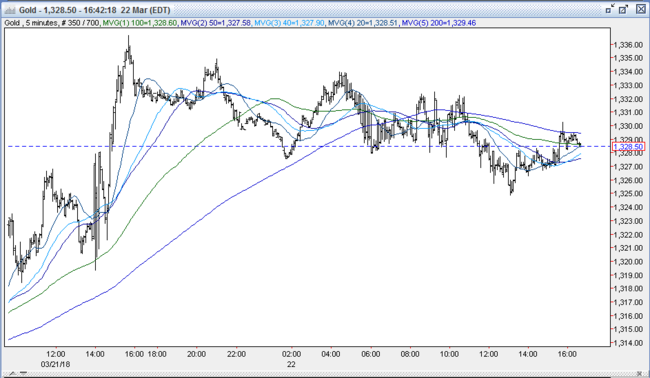 Gold retreated to $1327.50, where support at the overnight low held. US stocks opened much weaker (S&P -41 to 2670, tech leads decline), and losses accelerated into the late morning, with a continued pullback in oil (WTI to $64.25) contributing to the decline. The 10-year bond yield continued to pull back in a move to safety, and reached 2.799%. However, the dollar advanced as weakness in sterling ($1.4170 - $1.4076, despite BoE hinting at a May rate hike) and the euro ($1.2297) over trade war concerns took the DX to 89.90. 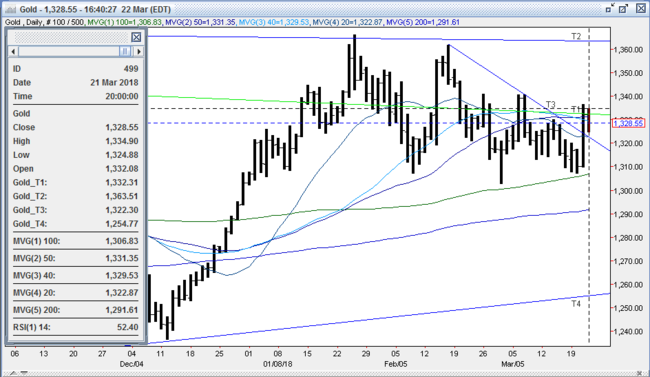 Gold was caught in the cross currents and edged lower, and took out the prior low to reach $1326.90. Early in the afternoon, the $60 billion in retaliatory tariffs against China were unveiled. However, they contained a 30-day comment period – which markets perceived as a potentially diluting factor - and were termed by Commerce Secretary Ross as a “negotiation”. This, combined with the House passing the $1.3T spending bill – moving closer to avoiding a government shutdown Friday - took US stocks off of their lows. The 10-year yield rebounded to 2.848%, and the DX remained firm (89.81 – 89.91). Gold retreated further, and made a fresh low at $1325. Later in the afternoon, US stocks turned down again and finished near their lows (S&P-69 to 2643, industrials, materials, and financials lead decliners). The 10-year yield dipped back to 2.813%, but the DX remained firm between 89.75– 89.87. Gold drifted higher to $1330, and was $1329 bid at 4PM with a loss of $3. Open interest was up 13.3k contracts, showing a good chunk of new longs (in addition to a healthy amount of short covering seen) from yesterday’s rally. Volume surged with a whopping 555k contracts trading. Bulls were disappointed with today’s loss – given the sharp decline in stocks, the pullback under 2.85% in the US 10-year bond yield, and the DX failing to regain the 90 level. However, they are encouraged that gold held support at $1328-30. Bulls will need the DX to take out the double bottom at 89..39 (last night’s and 3/7’s lows) for gold to breach resistance at $1341 (2/26, 3/6, and 3/7 highs), and challenge the next resistance levels at $1347 (2/20 high), $1351 (triple top 1/29, 2/1, and 2/2 highs), and $1362 (2/16 high). Conversely, bears will take today’s decline, given the price action in stocks, bonds, and the dollar. They’re still comfortable selling into strength, and think that yesterday’s rally might have overextended. The bears still maintain the DX will resume its bounce off of the 88.25 low last month to pressure gold lower. They are targeting a breach of support at the prior resistance at $1320-22 followed by the quadruple bottom at $1307-10 to bring into play key support at $1303-06 (100-day moving average, 50% retracement of up move from 12/12/17 $1236 low to 1/25/18 $1366 high,3/1 low). Below here, bears expect further long liquidation to lead to a test of the 200-day moving average at $1290. All markets will continue to focus on the volatility in the equity and bond markets, geopolitical events, developments with the Trump Administration, oil prices, and will turn to reports tomorrow on Japan’s CPI, US Durable Goods, New Home Sales, Baker-Hughes Rig Count, Commitment of Traders Report, and comments from the Fed’s Bostic, Kashkari, and Rosengren for near term direction.